Planning is already underway for the Highland Archaeology Festival, the huge celebration of Highland heritage which takes place in October, organised by The Highland Council. New this year is a chance to capture a bit of Highland Heritage in the HAF2017 photographic competition. 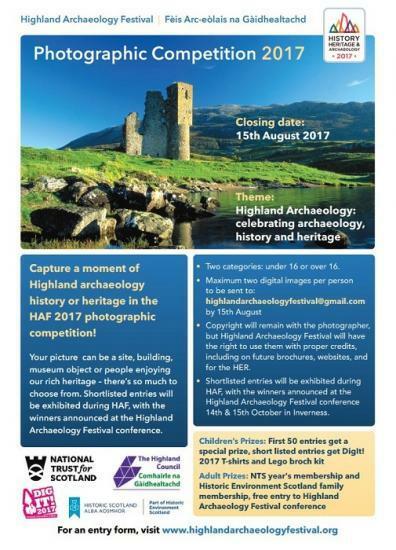 The competition invites people to submit one or two pictures which celebrate Highland archaeology, history or heritage. Highland Council Archaeologist Kirsty Cameron explains: "It could be a monument in the landscape, a building, an object in a museum or people enjoying our varied heritage - there's so much to choose from. We've kept it simple, with entries invited from under 16s and over 16s." Prizes for the under 16s are courtesy of DigIt! 2017- chocolate brochs for the first 50 entries, and T-shirts and broch lego kits for the top 7 entries. For adults, the National Trust for Scotland and Historic Environment Scotland have each donated a year’s membership and we are offering free entry to the Recent Archaeological Discoveries and Research conference in October. The deadline for entries is Tuesday 15 August to allow the shortlisted entries to be displayed during Highland Archaeology Festival which runs from 30 September to 15 October. Winners will be announced at the conference on Sunday 15 October in Inverness. During the Festival organisations, museums and individuals have offered over 100 events and exhibitions throughout the Highlands, as well as a museum trail and new for 2017, a geocache trail. Details are already posted on the HAF website www.highlandarchaeologyfestival.org , and a printed brochure will be available at libraries, service points, tourist information points and other venues from early September.
. Highland Archaeology Festival is part of Scotland’s Year of History, Heritage and Archaeology 2017.